 A Boy And His Tiger: Paying Grown-Up Homage To CALVIN AND HOBBES | Birth.Movies.Death. A look at some tributes to Bill Watterson's legendary comic. TRIGGER WARNING: This article contains and discusses an image depicting an unsuccessful suicide attempt, as well as an image containing gore. Calvin and Hobbes – drawn, painted and written by Bill Watterson from 1985 to 1995 – is one of the greatest achievements in the history of comics. And as far as comics crafted by individual artists go, for me it stands alongside Stan Sakai’s Usagi Yojimbo as the best of the best. Watterson – a famously private and thoughtful person – chose to conclude Calvin and Hobbes and retire from comics when he reached a point where he felt he had achieved all that he could with the strip. Barring recent, and by design short, collaborations with fellow cartoonists Steven Pastis and Berke Breathed, he has remained in retirement since ending the strip. Given Watterson’s pointed refusal to allow the strip to be commercially licensed, the completed Calvin and Hobbes stands as most of its own legacy. The non-Watterson portions of the strip’s legacy are found in its lasting influence, in the storytelling tools and artistic flourishes comic creators learned from reading it. Sometimes these are quiet hat tips – a style of landscape, an arrangement of panels, the wind of a conversation. And sometimes they are explicit pastiches, invocations of an adventurous, philosophical kid and his ever-loving, deep-thinking, homicidal psycho jungle cat buddy. It takes care and thought to successfully pay explicit tribute to Calvin and Hobbes and Watterson. 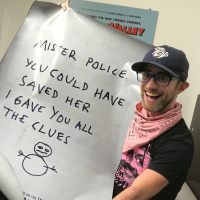 If the homage is ill-conceived, the entire project may be derailed – conjuring the horrific specter of 10,001 dreadful mash-up t-shirts instead of honoring Calvin and Hobbes’ brainy, gorgeous spirit. This is doubly true for salutes done in comics meant for a grown audience. Calvin and Hobbes can be read and loved by anyone. Entering into a conversation with it in a work meant primarily for adults requires strong craft and a stronger thesis. The creative team needs to have their hows and whys in order, in other words. 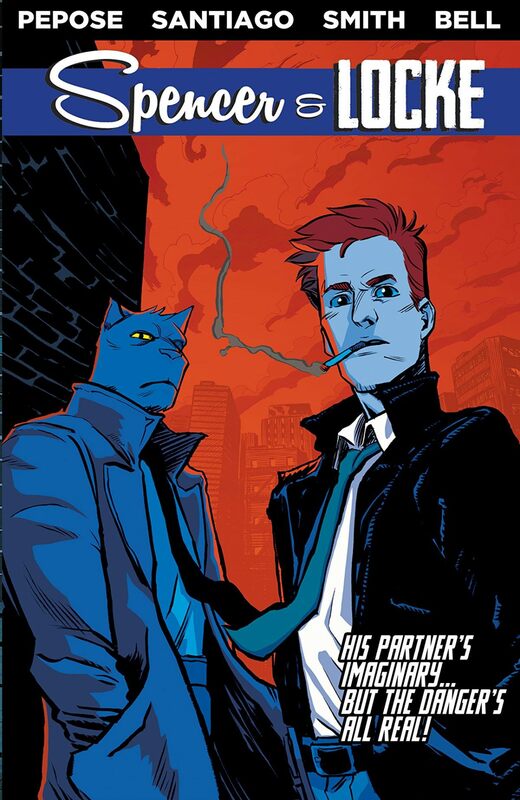 In elevator pitch form, Spencer & Locke is what you find at the intersection of Calvin and Hobbes and Frank Miller’s Sin City. As dissonant as that combination may be, there are some key points of connection between the two. Both Calvin and Hobbes and Sin City are stories interested in loneliness, with protagonists who could (very) broadly be similarly described as seekers making their way through a vast and often unforgiving world. Both are set in a striking landscape (the vast Midwestern woods and the brutal city) that directly influences the stories they tell. There’s even some stylistic crossover – Calvin occasionally imagined himself as a hard-boiled detective who lived in a black and white (both visually and morally) world, and at least two members of Miller’s battered, trenchcoated round table turned to their imaginations as a method of escape or processing. A blend of the two could work. Where Santiago and Pepose stumble is in doing more than just blending Watterson and Miller. 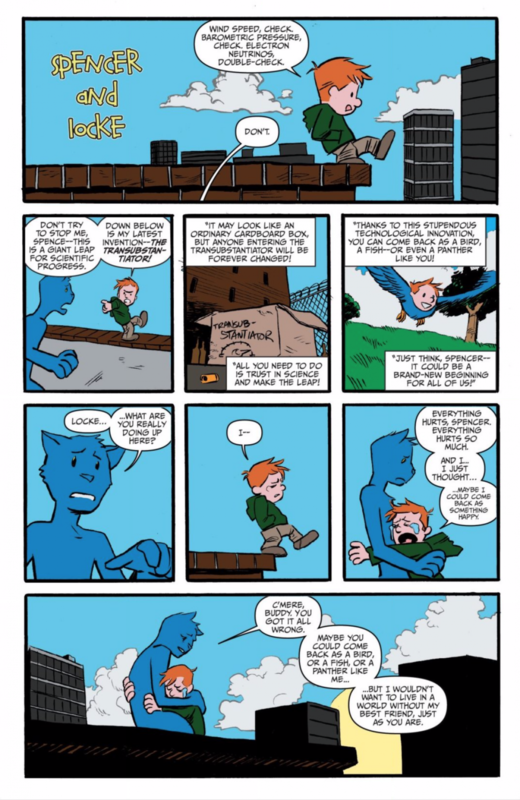 The cast of Spencer & Locke are direct analogues to Calvin and Hobbes’ cast, plus about 20-30 years of constant trauma. Locke is Calvin. Spencer is Hobbes. They’re out to solve the murder of Sophie Jenkins/Susie Derkins. Up until the last stages of the story, there’s very little about them that isn’t tied directly to their inspirations. With what is there (particularly during a flashback to Spencer talking a young Locke down from attempting suicide) there isn’t enough time for it to do its work. Thus, what should be formative events in Locke’s life play less like defining moments and more like a poorly done Calvin and Hobbes darkfic. Visually, Pepose works decently when drawing on Watterson’s style, and his own work is quite striking – but it has more in common with Francesco Francavilla’s noir than Frank Miller’s noir. And when a full half of Spencer & Locke’s key influences don’t add much more than surface level brutality and brooding (absent is the loneliness, bruised romanticism and skillful surrealism that defines the best of Sin City), the book collapses. 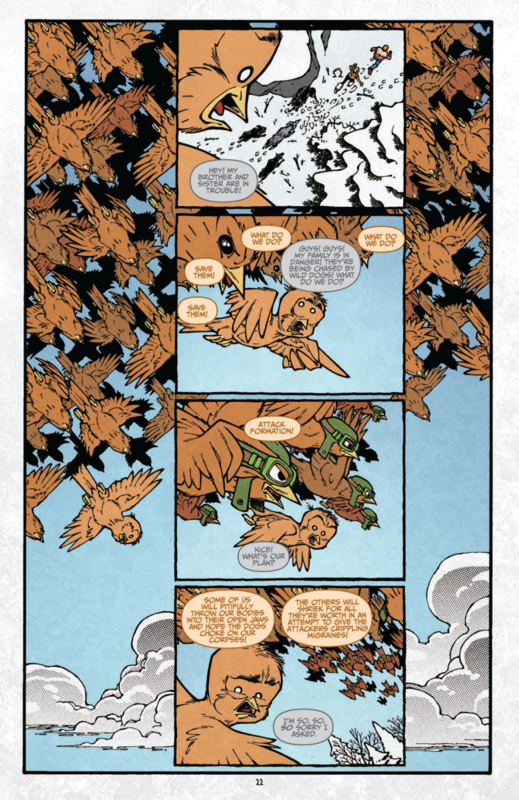 Gabriel Rodriguez and Joe Hill’s Locke & Key, on the other hand, knows exactly where its towel is when it comes to its tribute to Calvin and Hobbes. 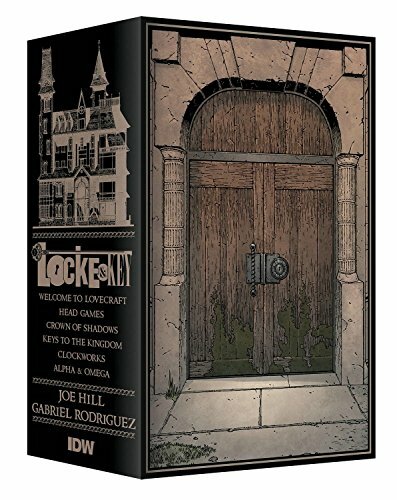 A coming-of-age and coming-to-terms horror story, Locke & Key follows the three Locke children (Tyler, Kinsey and Bode) as they battle a demon named Dodge who has a history with their murdered father for control of a set of magical keys. While Tyler eventually emerges as the story’s overall protagonist, each of the Lockes has a turn in the spotlight. Just over halfway through the series Bode, the youngest Locke, discovers the Animal Key – which, in conjunction with a particular door, transforms its holder into the animal that best reflects them. Bode turns into an adorable bird. Dodge turns into a vicious wolf. Rodriguez and Hill style the portions of the issue that take place from Bode’s perspective after Watterson, while maintaining their regular style for the portions from Tyler and Kinsey’s perspectives. Rodriguez and Hill are in direct conversation with Watterson. Like Calvin, Bode is a bright, creative kid looking for both adventure and an outlet (and he’s shown to be a fan of Calvin and Hobbes itself). The world, especially with the keys, is a wide and often wonderful place to him. He understands how serious the conflict with Dodge is and deals with more than his fair share of trauma, but he still views life through a different lens than his older siblings – so an adventure that recalls the flights of fancy Calvin and Hobbes entertained is rendered in the style of their stories. The dissonance between Bode’s Wattersonian perspective and Tyler and Kinsey’s Rodriguezian perspective generates tangible narrative benefits – humor both whimsical and mordant, an underlining to the horror as it’s seen by Tyler and Kinsey and pathos. Rodriguez and Hill do not return to Watterson’s style after this issue, but it proves to be one of Bode’s most important experiences in the whole book, and it factors into the denouement in a genuinely lovely way. In engaging with Watterson and Calvin and Hobbes not only in visual style but character and narrative, Rodriguez and Hill craft a worthy salute that simultaneously stands proudly as its own comic. Justin Harrison is a writer based in Austin, Texas. He moved there for school, graduated, and would like to stay if possible. He would also like more folks to watch Miami Vice and The Brothers Bloom. Next let's get on solving world hunger. Why Bill Watterson never wants an animated CALVIN & HOBBES movie. A fanmade Hobbes plush doll raises the question: why hasn’t anyone really sold these?